The following articles, reports and papers were produced by a wide range of civil society organisations involved in the campaign against the EU – US trade agreement TTIP. They give an overview of existing analysis and debates on Food, Farming and animal rights in TTIP. “The U.S. simply lacks essential rules that should curb the meat industry’s worse practices that cost taxpayers millions in environmental and public health costs. The Transatlantic Trade and Investment Partnership (TTIP) negotiations are already influencing European policy even without being agreed to—this is clear from the EU’s recent decision to scrap their methane cap from their National Emissions Ceilings Directive. With TTIP, the EU industry will also ensure that pending decisions on critical issues such as cloning and glyphosate are made with trade ‘competitiveness’ in mind and not the public interest. A TTIP deal would basically hand over Europe’s animal farming sector on a silver platter to transnational meat corporations–through tariffs and quota expansions, but definitively through the sweeping de- regulatory changes the industry hopes to win through the accord.” Executive summary and press release here. This article is an introduction to food, farming and animal rights in TTIP. TTIP will promote an industrial model of food and farming, threatening the survival of small family farms, local food initiatives, standards for healthy and safe food, animal welfare, the environment, and public health. This article details what the US food industry wants. What the industry US food industry lobbying for, and therefore what are probably the US demands? IATP is an American NGO. In this paper, IATP outlines some of the concerns for healthier, more equitable and sustainable agriculture and food systems : food safety, chemical policy reforms, procurement policies and local foods and the impact of the financial service reforms. 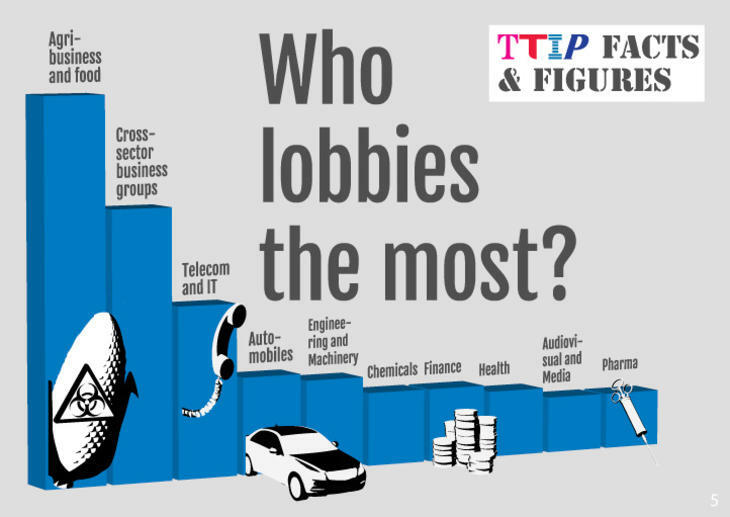 A summary of the food issues and TTIP, with several food-specific graphics. EU and national governments have repeatedly claimed that the EU’s ‘farm-to-fork’ approach to food safety is not under threat, and that food safety standards will not be compromised by the TTIP EU-US trade deal. However, Friends of the Earth Europe believes pressure from US trade officials and the US factory farm industry is already leading to a reduction in food standards, and possibly even as a condition for the US to sign the TTIP trade treaty. Friends of the Earth Europe accused President Juncker of breaking his promise to make decision-making on GMOs more democratic and of acting as if the controversial TTIP EU-US trade deal was already in place. How the American and European pesticide industry is using ongoing EU-US trade negotiations to lower human health and environmental standards in order to increase trade in toxic pesticides. Comprehensive report.